Are you trying to achieve healthier and longer hair in this 2014? These are some things i will be doing more to achieve this goal. Eating healthier - healthy hair starts from within. If you are not getting sufficient nutrients from your meals, invest in a good multivitamin. Drink sufficient water- water helps to move nutrients through out our body. Find your staple hair products and tools- clean your shelves. keep those products and tools that work for your hair and give away those that you hardly use and do not work for your hair type. Learn about your hair and what ingredients it likes and does not like. 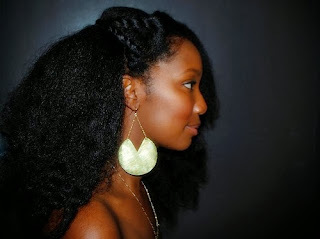 Protective style more often- protective styling helps retain length and maintain healthy strand. Apply the tips o, because i know you o.